Dragonfolk Studios - The Fynest Incense & Fragrant Oils In The Realm! The Fynest Incense & Fragrant Oils In The Realm, lovingly hand created by makers held in the highest regard by this Humble Artist & the ONLY such used in my Studios & home ~ for the last 20 years! All Food Safe Ingredients & NO petroleum products... Heavenly! Relax or invigorate, and adjust your attitude or stimulate your creativity as you grace your home with these lovely scents. Incense for those who enjoy watching graceful smoke curling and dancing; or fragrant oils for those who wish to provide the enchantment of fragrance minus the smoke. Either way, we highly recommend the romance and adventure of experimenting within the world of fragrance. Free Shipping on oils and incense if ordered with sculpture, book, or music. If an order is only for incense, shipping charges will be added when your order is accepted. Note 1: Euphoria has been discontinued by my supplier...I'm so sorry...but try the NEW Fragrances...My Treasured Clients at "The NY Renaissance Faire" have become Entranced! Note 2: Any incense only orders under $20 will not be filled. Note 3: If you intend to visit me at an Art Show & let me know at least 2 weeks in advance, you may pick up your Incense Order in person, thereby saving the shipping Charge! 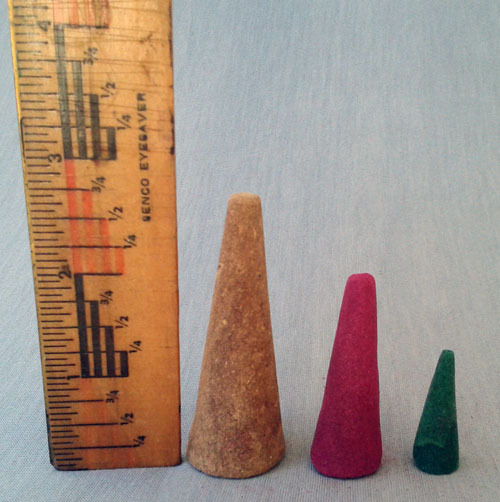 Pictured here is a size comparison of the DFS Incense Cones. (Click to enlarge) The medium size (2", formerly called "Large") has been discontinued by the folks who create these marvelous fragrances for me, replacing them with the Gi-gunda size. 10 1/2" burn 25 min. Oils may be used in Diffusers, Oil Warmers & on the Skin.